Most popular excursion from Varanasi is Sarnath. Another sacred place where Buddha turned the wheel of Dharma. Buddha delivered his first sermon in a deer park just outside of city of Kashi. He probably chose this place as it was an important crossroads of that time, an established religious and commercial hub of those days. People who visit Sarnath doesn't realize it was an important place for the believers of Lord Shiva. Sarnath- as it is called today is the short form for Saranganatha which means Lord of deer, ie another name of Lord Shiva. Though Sarnath is popular as Buddhist pilgrim center the name came from a small shrine dedicated to Saranganatha which is a KM away from the popular imposing Dhamekh stupa. That is how there was a deer park in this place. On Hindu auspicious days this temple gets many visitors otherwise is a very quiet place. It seems the mantra- "Buddham sharanam gachchami" was originated in Sarnath. Being one of the four sacred Buddhist pilgrim centers Sarnath is where Buddha delivered his first sermon. Other three being Lumbini in Nepal where Buddha (then Prince Siddhartha) was born, Bodhgaya in Bihar where he attained enlightenment under the mahabodhi tree and Khushinagar in Uttar Pradesh where he entered into mahanirvana. 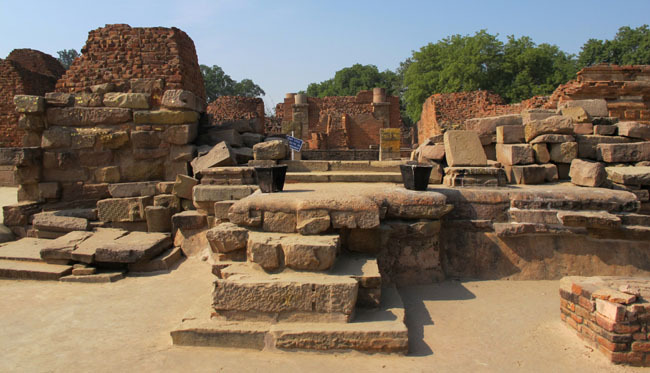 Starting from Emporer Asoka's days ie 3rd century BC till 11th century AD Buddhist structures were raised in Sarnath, ruins of which we see till today. Most imposing structure of all is the Dhamekh stupa which might have been built around early centuries AD. 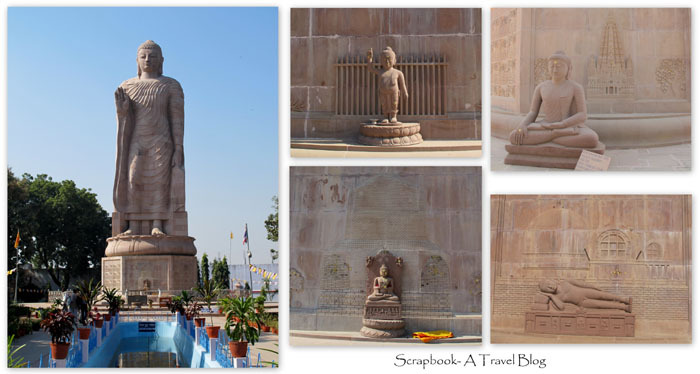 Monuments in Sarnath are in the list of tentative UNESCO World Heritage Sites and also a ASI protected monuments. So, unlike Varanasi Sarnath ruin sites are maintained very well and clean. From Dashashwamedha Ghat, Varanasi I took three shared autorikshaws to reach Sarnath, about 13KM. There are guides who approach you to show around for Rs.20 if you ignore they are even ready to drop the price to Rs.5. I felt sorry for him and paid Rs.10 for his services to show me around the garden and taking a picture of me. Though I got better information including a map from the tourism center located right opposite to the archaeological museum. 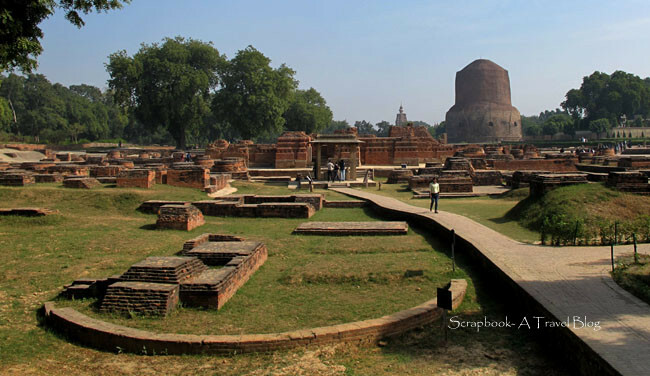 Good thing about Sarnath is- it is a small place with all the tourist attractions are in walkable distance. There are Buddhist temples representing different countries like Tibet, Japan, China, Thailand, Korea and Sri Lanka. No matter what for tourists the major attraction is the Dhamekh Stupa. Most of the ruins are found in one place protected by ASI. The massive Dhamekh Stupa can be seen from anywhere here. 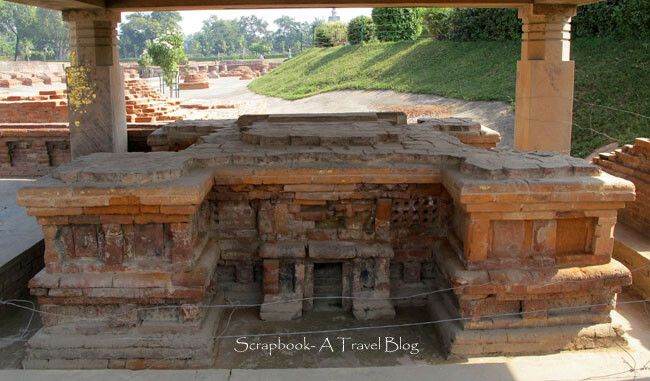 Built in bricks and stones, this ancient stupa was enlarged during different periods. Now, it is well above 43m in height. Some remnants of the intricate art that ornamented this structure can be seen even today. The original name was Dharma Chakra stupa later might have changed to the present nick name. I sat by the stupa on the green well maintained grass under the shade provided by this gigantic structure. There was a group of 20-25 from Japan or China who were wearing white robes. It was a very serene experience to watch these Buddhist devotees circumambulating the stupa in a line chanting the mantra. It is also a beautiful scene- that monks from different countries in different colored religious robes sitting on the grass praying with Dhameka stupa and other ruins in the background. The brick ruins of ancient Mulagandha Kuti can also be seen in this complex. Now, only base of the temple remains. From the thickness of the remaining walls looks like it must have been a lofty temple. Now, there is a modern Mulagandha Kuti Vihara right adjacent to the archaeological ruins complex, built the by Sri Lanka Mahabodhi society in 1931. Nearby is the sacred Mahabodhi Tree. It seems a branch of Mahabodhi tree in Sri Lanka was planted here in 1931. Very interesting to see is a Hindu temple in Panchayatana style (main shrine is surrounded by four sub-shrines, like the Lingaraja temple in Bhubaneshwar or Khandariya Mahadeva temple in Khajuraho) of unknown origin near the Mulagandha Kuti ruins. 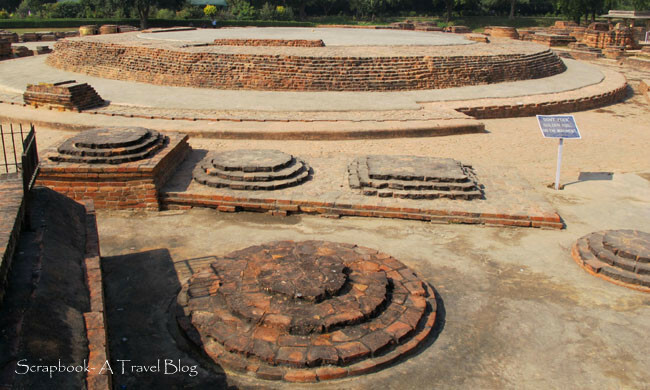 Dharmrajika stupa is another important structure among the Sarnath ruins. 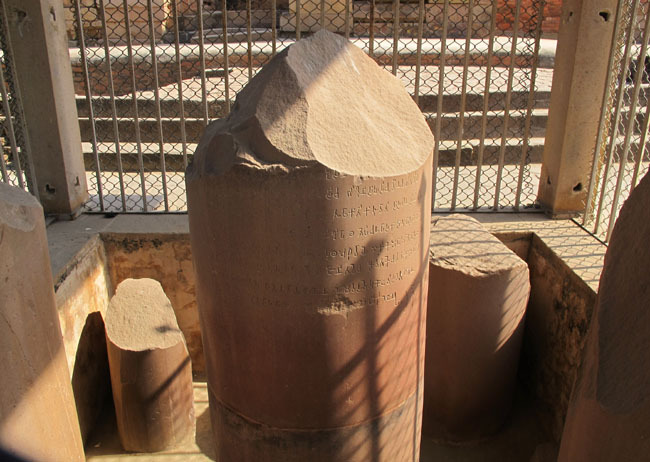 It is believed that it was one of the thousands of relic stupas built by Asoka. The structure was demolished by one of the Kings of Benares for the building materials. It is believed that, during demolition they found a casket filled with bones and gems inside the stupa. The bones were disposed into river Ganga and the gems went missing. Asokan pillar records the visit of the Emperor Asoka to Sarnath. It seems it stood 17m high those days now broken and displayed in the ASI Museum. Asoka built thousands of these pillars with inscriptions all around India and it is believed that this pillar was the grandest. The capital is displayed in the museum though the broken cylindrical pillar is still standing in the excavation site in an enclosure. There are many stupas and ruins of monasteries here. It seems during Gupta period this place had around three thousand monks living here. The Deer Park next to the ruins complex is a cool place. One can see deer grazing around. 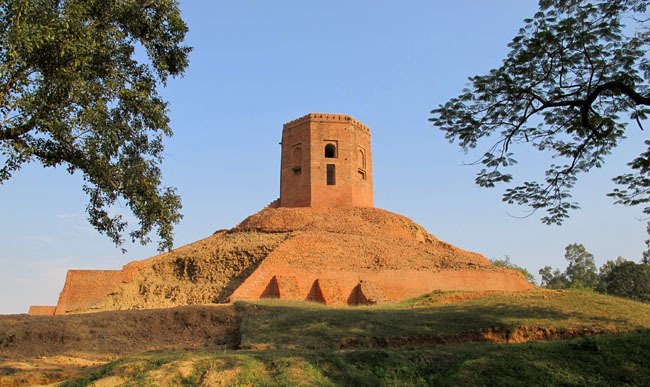 Chaukhandi stupa is the first monument a visitor encounters in Sarnath. It was built to mark the place where Buddha met his companions. Later in 16th century an octagonal structure was added atop to commemorate the arrival of a mughal to the city. The ASI Museum has a great collection of archaeological artifacts. The main attraction being the Capital of Asoka Pillar. 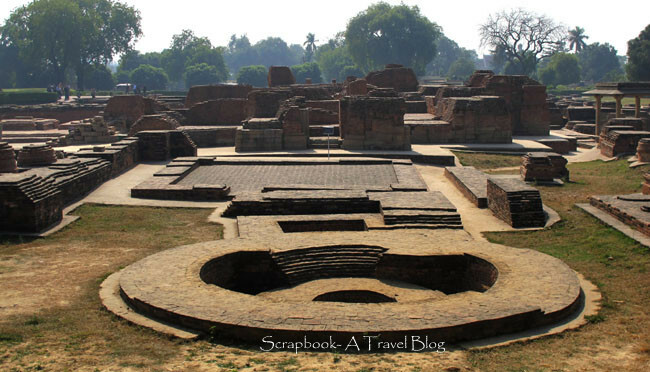 Well, apart from archaeological sites Sarnath is home for many Buddhist temples. Having visited Sanchi in Madhya Pradesh, Khushinagar in Uttar Pradesh, Bodhgaya in Bihar and several important monasteries in Sikkim I am longing to visit Lumbini. Oh my what a worthy day trip destination this is. I like visiting ruins and learning about history. The stupa image is very good. Thank you! Yes, a peaceful place! Love this beautiful place. Well written, Kusum. 'New Poetry'? interesting! Thanks, glad you found my blog interesting. My what an interesting trip. I'm still dreaming of visiting India. Beautiful historical places. My favorite is the stupa photo. Beautiful place and looks to be well maintained as well (as you wrote also). Good to connect with history, somehow is a meditation of sorts. Fir a couple of weeks it looked like I would be vitiating India later this year with work - but unfortunately it's not going to happen! I just have to look at your posts instead! This can be considered as the first teachings that lead to the beginning of Buddhism.